Lock in a great price for Hydroussa Hotel Hydra – rated 9.1 by recent guests! Great location! Clean rooms and friendly staff. I would definitely stay here again! Excellent hotel in the center of Hydra, from where you could easily walk to the port, to the beaches and generally stroll around. 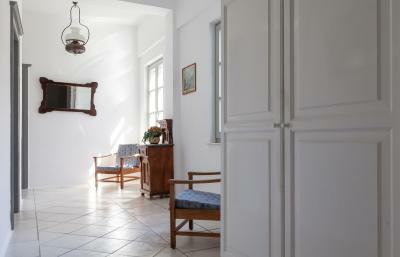 The room was quiet, perfectly sized and very nicely decorated in a rustique way, but with a fully renovated bathroom. We loved the courtyard in front of the hotel, where you could have your breakfast. The story of the hotel is actually very interesting - just ask the staff and they'll be happy to tell you, as they did with us. 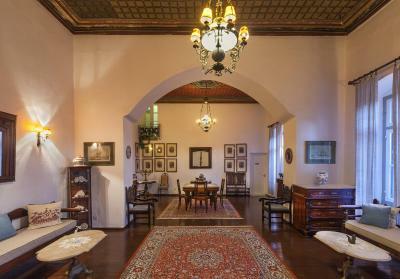 Beautiful historic building full of antiques but with an updated aesthetic in the rooms . 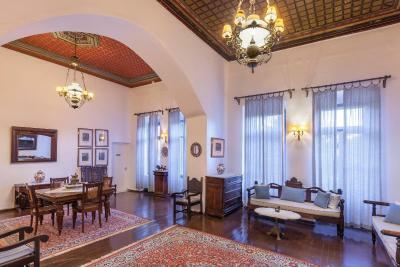 Perfect location ; close to the harbor but tucked away . Delicious breakfast on the patio and very helpful and friendly staff . Costa checked us in and was extremely friendly! The rooms were clean, recently renovated and had AC/window options. They provided extra towels for swimming and encouraged us to go to different beaches! The breakfast buffet provided several options but was alright overall - not amazing. 7 minutes from the ferry area and located in front of a cute small park. It’s very close to lots of popular restaurants and bars. You can also grab a book to read from their book stands. The property itself is amazing, staff was very friendly. Location is excellent, just in in the middle of Hydra village. 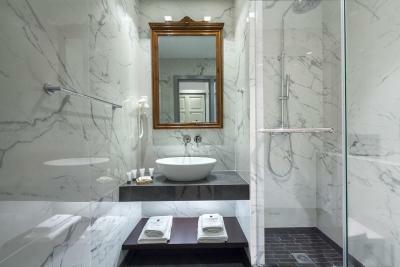 Beautiful room, large and well equipped; great bathroom; luxurious. Breakfast excellent. Staff friendly and welcoming. Everything about the hotel was perfect! The location is amazing, very close to the center yet very calm! The staff are always smiling and willing to help. The room was very nice and clean, as well as the whole property! Highly recommended! Excellent customer service !!! Let es the GM at the front desk !!! Amazin breakfast !!! Hydroussa Hotel Hydra This rating is a reflection of how the property compares to the industry standard when it comes to price, facilities and services available. It's based on a self-evaluation by the property. Use this rating to help choose your stay! 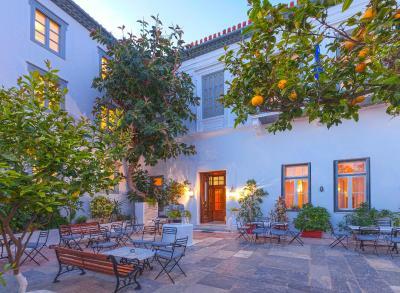 Just 350 feet from Hydra Port, this renovated mansion provides a unique base in a peaceful setting with a charming courtyard and free wireless internet access. 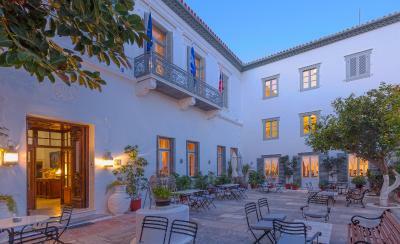 The traditionally built Hydroussa Hotel Hydra is located on Votsi Square, surrounded by lovely lemon trees. Due to its unique architecture, Hydroussa Hotel has been used in the past as a location for Hollywood films. Each room has private bathrooms, direct dial phone, air conditioning and TV. Hydroussa's highly trained staff is at their guests' assistance 24 hours a day. 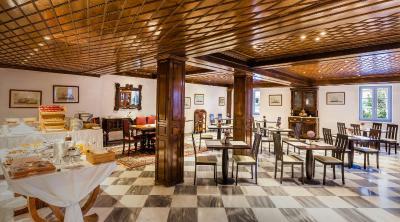 A complimentary breakfast is served in Hydroussa Hotel's elegant dining room. 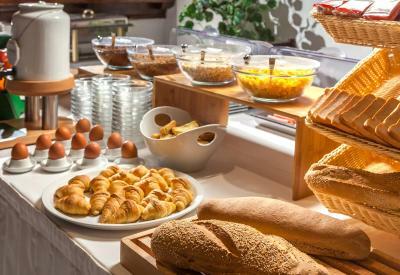 The American-style breakfast consists of scrambled eggs, bacon, sausages, as well as coffee and tea. 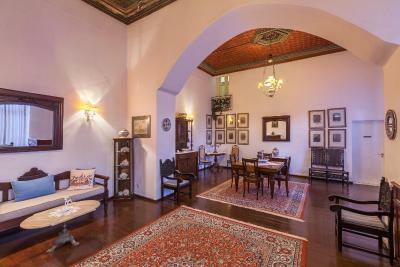 There is also a communal drawing room where guests can relax and socialize. 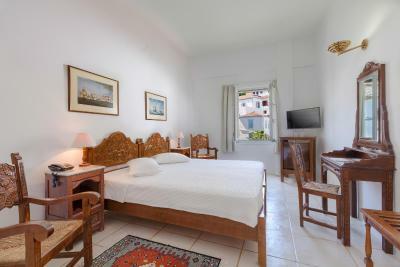 When would you like to stay at Hydroussa Hotel Hydra? Traditionally decorated room featuring wood carved beds and air conditioning. 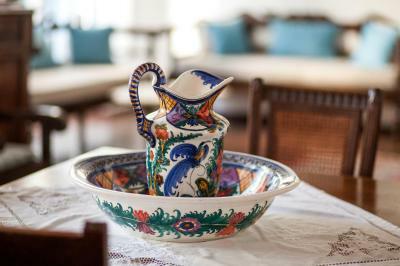 House Rules Hydroussa Hotel Hydra takes special requests – add in the next step! 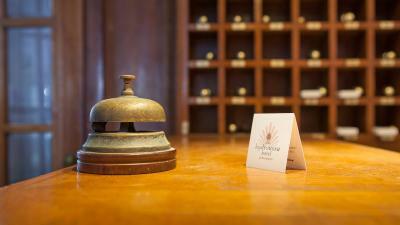 Hydroussa Hotel Hydra accepts these cards and reserves the right to temporarily hold an amount prior to arrival. This hotel has a lot of class ; large rooms, corridors, high ceilings. The owner is a very nice person taking the time to explain. We enjoyed everything about the place. Amazing staff and super surroundings. Everyone in our family of 5 loved the place. 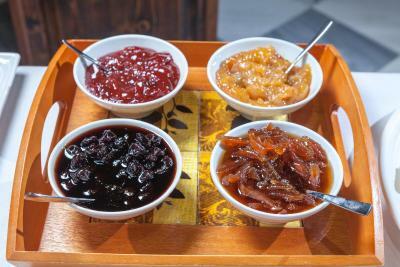 Some variation in the breakfast might have been nice but that is being really picky, there was plenty of choice. Tasteful update of a beautiful old mansion house, set in a pretty square filled with the scent of orange blossom and Flora's cake shop, what more could you ask? I wasn’t keen on the old heavy wooden bedroom furniture in the rooms. I loved the old building of the property and that it was within walking distance to the port. Breakfast was nice and the staff very friendly and welcoming. 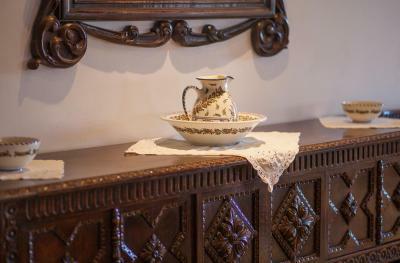 Beautiful historic building filled with antique furnishings. Delightful courtyard. Friendly, helpful staff who went above and beyond to make our stay special. Good breakfast, nice staff, great location 3 minutes walking distance to the port. Lovely period house with orange trees in the front. 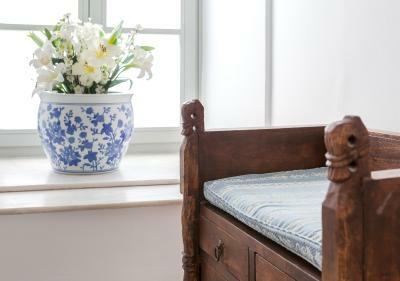 traditional furnishings, clean, comfortable beds. 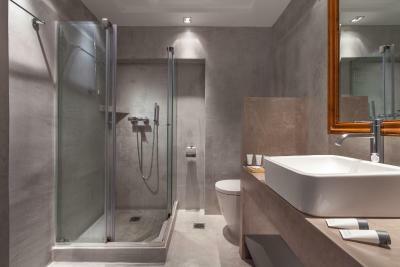 Very modern bathroom, and very good breakfast included. Hydra is quiet anyway but the hotel is set back but a short walk o the very pretty harbour. Great view from the window in the morning watching the mule trains delivering goods. Everything was excellent. My only suggestion would be to improve the variety of breakfast and the inside doors of the building for soundproofing, but these things did not actually disturb our stay in any way. 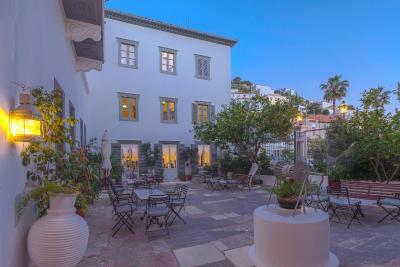 Located just 2 minutes from the harbour, this hotel was a pleasure for the eyes with its beautiful courtyard. Being the weather warm - even if was October - we had breakfast (a very rich one) outside. The room itself was not overwhelming, but the view of the small square, the mountains, the white houses of the village and the sea was just amazing! Plus, it was clean. Staff very friendly and helpful, sure we will be back. Limited closet and drawer space, and no ventilation in the bathroom (as usual in most places). 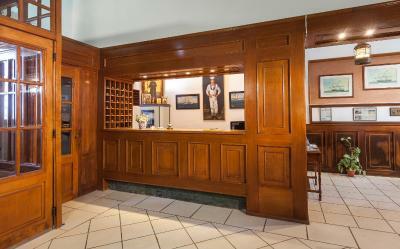 A beautiful historic hotel with a lovely countyard in an excellent and quiet location, but also near the harbor area. The room was newly renovated and clean. Breakfast was great and the staff very helpful. It’s a lovely property in an excellent location, and the staff is wonderful—very helpful and polite. Our email request for a baby cot was confirmed within minutes. The room we stayed in was spacious and had been recently renovated. It was a lovely stay.